I wrote a piece recently looking at an OECD report that proffered six attributes of future public servants in a world that is becoming more connected, complex and (sometimes) confusing. These were the six -iteration, data literacy, user centricity, curiosity, storytelling and (a personal favourite) insurgency. This time I’m looking at a couple of linked pieces of work about what it means to be a “21st century public servant”. One comes from the University of Birmingham in the UK and the other from Melbourne University’s School of Government. They are now a few years old but both pieces of work illuminate some more of the thinking about the talent base for a future public service and about the context of change from which their prescriptions emerge. The Australian research was kicked off by a 2012 discussion paper, jointly prepared by the School of Government at Melbourne University and the Victorian Department of Premier and Cabinet. The paper starts where most of these pieces of work start, sensibly enough, which is with the context and environment in which the whole idea of a new set of skills, and their talent implications, for public servants starts to make sense. In 2012, the context included “the impact of globalisation, changing citizen expectations and technological change,” combining to create “a different environment for the public service of the 21st century.” Policy advice has become more contestable from multiple new sources, co-production and the more intense engagement with citizens and service users is shifting from mantra to practice and new digital tools offer the promise, if not always the performance, of reinvigorated democratic engagement. The implication is a public service anxious to reshape from “the rigid bureaucracies of the early 20th century” towards what we’re now beginning to see as a familiar litany of “the new” – a more agile and flexible public service, with a more diffuse, open and collaborative way of working. simulation and experimentation, which will require engaging with the frontline or walking in the shoes of users. Control: ensuring legal, financial and democratic standards are met. These themes are drawn from another UK report, jointly prepared by the University of Birmingham and the think tank Demos, called When Tomorrow Comes: The Future of Local Public Services. The report presents the work of a Policy Commission that worked between 2010 and 2012 to examine in some depth the likely shape and work of local public services in the UK. Some important “C” words there, not the least “commercialisation”, recognising the increasingly urgent need for a new kind of literacy in the public sector to do with more complex bundles of private and public value, and “control”, a kind of bedrock public work attribute – rigour and high levels of administrative hygiene. Another “C” word – commissioning – gets a significant mention too as part of the shifting context within which specific skills and capabilities are required to maximise efficiency, public value and long-term service reform. The report calls out the work of Gary Sturgess especially in a couple of reports, here and here, that have become standard references for the commissioning debate including calling out the difference between commissioning and contracting out. They are neither synonyms nor inevitable staging posts on the continuum of service reform options. Not very much missing there. Actually, it’s an impressive list. Any list of future skills attributes for public servants is impressive that includes “social intelligence” (especially important, it strikes me, if we are to improve the context-specific approach to policy making that pulls policy and delivery much closer together), “transdisciplinary”, which might even now be too modest as we start to think about “trans-contextual” work, and then “design mindset”. Just those three on their own represent a pretty demanding talent trifecta. If you stop and think about those ten skills for a moment, and then do a quick check in your own mind how well you would assess the current public sector is doing on gathering and growing the requisite talent those attributes imply, you get a glimpse into the necessary scope and ambition that I think needs to infuse our answers to the “question of talent” in the public service of the future. Redesigning services and delivering them digitally. There are some big themes emerging from studies like these, at least in my mind. The persistent values and capabilities of public work – rigour, impartiality, ethics, fairness, a care for and pursuit of the public or common interest, a concern for the long term – are now mixed with aspirations for a new set of “traditional” skills that, in the future, will be just as valuable for effective public servants – innovation and the ability to think beyond the usual, a capacity for speed and agility, the capacity to lead whole systems and curate complex communities of skills and expertise to achieve big public results – better health, skills for work, safer and “smarter” cities, climate adaptation – that can no longer be “delivered” in a simple or singular production model. Public servants will be expected to be more commercial or finance-savvy as well as much more nuanced in the blend of thinking and doing – or policy and delivery – from which better results and longer-lasting impact will invariably derive. And all of this within the context of increasingly volatile landscape of political and community opinion and, at least by some assessments, a policy environment that has grown timid, constrained and increasingly willing to confuse spin and style with substance and sustained, difficult analysis, debate and trade-offs. 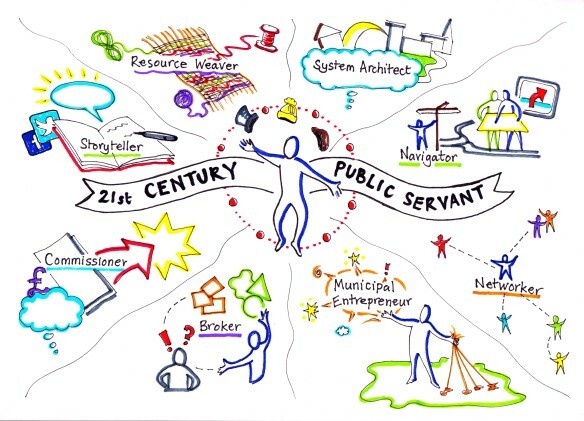 What does it mean to be a 2st century public servant? The UK report on which the University of Melbourne work drew had the same focus on the 21st century public servant. It asked the same basic question – what does it mean to be a 21st Century public servant? What are the skills, attributes and values which effective public servants will display in the future? How can people working in public services be supported to get those skills? In other words, and in an important addition to the debate, the report effectively calls out the reality of a “public purpose” sector. This is a concept I first came across many years ago in the work of American sociologist Lisbeth Schorr. In one of her books, she notes almost as a throwaway line that it had become increasingly misleading to see the results and impact that policy was trying to have as a function simply of the work of the public sector (and, by inference, of the work of formally defined and specifically employed public or civil servants.) She used the phrase “public purpose” sector to describe what she argued then should be a new focus for capability and investment. Although hardly a new phenomenon even then, and certainly not now, the idea that the question of talent for the future of the public service has to embrace people and institutions inside and outside its formal institutional boundaries is important Not only do we need to think about answers to the talent question in terms of the talent we need both inside and outside the public sector – in the more broadly defined “public purpose” sector – but we need to think too about the specific talent mix that is required to lead, manage and work in, across and between the different domains that make up the public purpose sector. Public purpose sector leadership is itself a rising talent requirement of a modern public service. Back to the UK report. It concluded that some of the new roles that will be taking up the work (and talents) of public servants in the future included story-teller, resource weaver, systems architect and navigator. Storytelling and navigating are both skills which betray the increasingly complex and networked environments within which we will expect public servants in the future to work with confidence and impact. Concepts like “weaving” and “navigating” imply complex contours, multiple players and the need for strong narratives of change to hold things together for focus, persistence and impact. By the by, the concept of “publicness” will probably bear some more thinking in the review of what these reports tells us about the talent set necessary for a modern public service. It hints broadly at a powerful architecture of values and assumptions about holding on to a sense of the value of “public” in the first place – common interests, equity of access, engagement and service and the ability to articulate the distinctive role of public institutions and governance, partly as platform but also as direct and significant player. The skill set identified in the co-production literature suggests that it is a combination of more informal roles (‘part good neighbour’) with more formally trained roles (‘part facilitator, part advocate, part support worker’). The expertise for more effective relationships with citizens may well not exist within the corporate centre of the organisation but on the periphery. The fleet-of-foot worker, who manages a portfolio career and an emotionally rich engagement with citizens at the same time as exercising personal development and self care, risks being as mythic as the heroic leader who will single-handedly lead an organisation to success. It is of course more likely that attributes will be pooled within teams rather than displayed within one person. The 21st Century Public Servant is a composite role and exists to illuminate a series of working practices rather than to provide a blueprint for a single worker. The question is how many of these skills and attributes should we expect to find in any one public servant or group of public servants or, more broadly, public purpose workers? 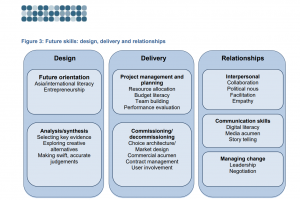 How does the skills profile, and its associated talent bundles, change with context including role, geography, and policy and delivery domain? And how useful are the gathering lists and prescriptions for talent as a basis on which to make judgements about recruitment, retention and reward? To what extent would a more determined approach to ‘fixing’ the talent dimension of the public sector fix the larger challenges of the public sector itself, absent complementary shifts in ideology, culture, leadership and day-to-day practice which, in turn, reflect bigger but often unstated assumptions about the wider perception of the public sector’s institutional and instrumental value and contribution? Final note: a couple of Australian frameworks. Terry Moran and Chris Eccles were colleagues in the Victorian Department of Premier and Cabinet. Terry went on to head the Prime Minister’s Department in Canberra (and is now Chair of the Centre for Policy Development, on whose Board I also sit) and Chris is now the Secretary of the Premier’s Department in Melbourne, after having done a similar role in South Australia and New South Wales. But he’s unequivocal that developing Public Administration 4 as part of the response to digital disruption linked to globalisation is our next big professional task. Being able to pull together that blend of the persistent values of the past with the insistent skills and values of the future is itself rapidly shaping up as a key talent demand for the public service of the future. Chris Eccles speech about the way the public service might look in 10 years takes as its ‘text’ the fight to eradicate TB, one of the great public service ventures of the past century. His point is not to suggest we go back to the 1940s. Today’s policy challenges are more complex and the field of public work challenges and priorities more crowded. Enlist the entire community in the solution. Ultimately the victory against T.B. shows that good public policy must have a clear picture of the outcomes it wants to achieve. And it must demonstrate how those outcomes will make our lives better. A talent to discern, and then activate, a distinctly moral purpose might not be the first item on many lists of the skill requirements for a modern public service, but it’s likely to strike a chord with those whose chief complaint is that much of our contemporary conversation about the public service lacks sufficient appreciation of the morality and purpose of public work. Beneath the vanities, self-interest and extravagances of any government there is, at least, potentially an element of vision about a juster and more humane society. It is the function of the administrator to recognise that vision and work to give the vision a local habitation. Hmmmm …. an interesting and thorough set of reflections Martin … but just where are these super-human individuals to be found? “In a fixed mindset, people believe their basic qualities, like their intelligence or talent, are simply fixed traits. They spend their time documenting their intelligence or talent instead of developing them. They also believe that talent alone creates success—without effort. In a growth mindset, people believe that their most basic abilities can be developed through dedication and hard work—brains and talent are just the starting point. This view creates a love of learning and a resilience that is essential for great accomplishment. Virtually all great people have had these qualities”. If we subscribe to the view that the public purpose sector is complex and rapidly evolving then the most important attribute of a successful public servant comes down to their ability to get stuff done … to execute policy and service delivery reforms … in order that we may learn what works and what doesn’t. Increasingly, ‘getting stuff done’ involves delivering through technology. If you can’t deliver through technology (in the second decade of the 21st Century) you can’t get stuff done. Sorry! Too many public servants display fixed mindsets, grounded in ideology and endless policy debates that are not informed by facts because the ideas are never actually operationalised … or they take so long to be put into practice that the world shifts around them.By the time the ‘grand solution’ arrives the ‘problem’ has moved on. People with a growth mindset are more motivated to do something useful quickly, learn and then improve on the situation … which is inherently more engaging, effective, adaptive and resilient. I like the schematic, and of course we need to wear many hats – or build teams of people that can comfortably wear different, complementary, hats – but the bias has to be to people with a growth, learning, mindset that have the skills to execute policy and service delivery reform through technology. Totally agree Steve…the growth mindset is where we are heading. So we either find such people as an act of deliberate recruitment policy or strategy or we grow such people by nurturing their propensity to learn, try, adapt, learn some more. And they demands a particular style of supportive, demanding and permissuve leadership. So my question is do we see in the public service the kinds of leaders and leadership conducive to this kind of growth mindset?